I was never a Trekkie. I never had that fanboy appreciation for the series or films that ensnares half of the geek culture. (because let’s face it, you’re either a Trek fan or a Star Wars fan.) I came to Star Trek by a much longer route, through the films, Wrath of Kahn is still my favorite, and eventually through my children. Yes, because my 9 year old loves Batman ’66 as much as I do, and the original Star Trek series is aired on the same station on Saturday nights. He wants to watch it, so we do. It’s great. Planet of the Apes was before my time really. The first film came out in 1968, with subsequent films and shows filling up the better part of the next decade. I remember specifically a PoA trash can at a cousins’ house, perhaps some of those 12 inch dolls…but I never saw the film until I was in high school. The scene on the beach wrecked me, and I realized what a powerful film it had been only later, when I’d got some distance. Thanks to the wizards at IDW and Boom! Studios we now have the clash of the 60’s titans with an epic pairing in Star Trek/Planets of the Apes: The Primate Directive. Issue 3 seems to be the tipping point in what could be a universe-shattering series. What’s happened up to now? Kor, the Klingon general from TOS, has found a way to slip through dimensions in an attempt to circumvent a treaty with the Federation. That dimension has led to an Earth where apes are the dominant species, and he has begun slithering into their good graces by supplying them with automatic weapons. The Federation has dispatched their most trusted ship, the Enterprise, to investigate, and they find the same tear that a certain Colonel from the U.S. of the late 60’s also found. They discover the Klingons, and slip through to the other dimension and find Col. George Taylor camped on the beach next to the remains of an iconic green lady. 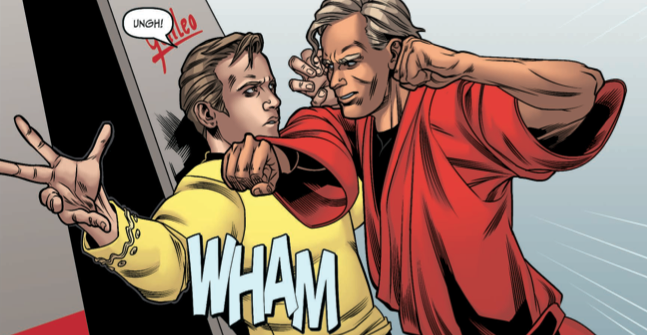 In this issue, the tensions that have been developing between Kirk and Taylor erupt, resulting in a Godzilla vs. King Kong style fistfight aboard the Enterprise. At the end there is no clear winner to the fisticuffs, but both Taylor and Kirk are resolved to help each other in what ways they can. It’s a solid premise that veteran comic writers Scott and David Tipton have posited. It makes sense to both universes that this could happen, and in pairing these to franchises shows the distinct similarities that both were known for. Each franchise looked at the disparity between races, or species, in a way that promoted cooler heads by the end of the story. This series does that, and melds the two themes of “which is the animal and which the man” and “do we have a responsibility to interfere” that each series focused on in a realistic way. Rachel Stott’s art is great and captures the look of the characters as they were in the sixties, which leads me to believe that she’s been watching a lot of MeTV over the course of this book. She adds little bits and pieces that make you wonder, such as this strange and “knowing” glance between McCoy and Nova, which leads you to wonder what subtext may be going on. It’s the little things like this that make her work fun to look at as you read along in the comic. 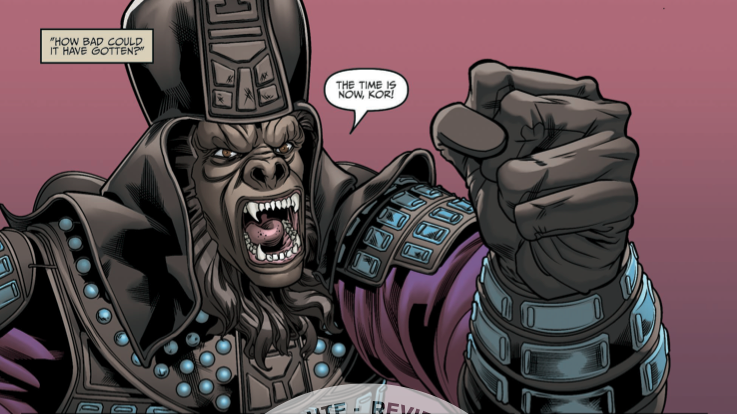 Star Trek/Planet of the Apes: The Primate Directive #3 comes to a close with both sides resolved to face the bigger threat, that of an ape military armed with Klingon weapons. Scott and David Tipton stay true to the spirit of both franchises, and in doing so advance the cause of both as a whole, and have made be a tentative Trekkie. This entry was posted in BOOM Studios, brad gischia, Comic Book Reviews, comic books, David Tipton, IDW, IDW Publishing, planet of the apes, Rachael Stott, Scott Tipton, small press, star trek and tagged BOOM! Studios, brad gischia, Charlie Kirchoff, comic book reviews, comic books, David Tipton, idw publishing, Planet of the Apes, Rachael Stott, Scott Tipton, small press, star trek, Tom B. Long. Bookmark the permalink.